The two first Tunnel Boring Machines are being assembled in Germany by Herrenknecht right now. In total AGJV will have four TBMs at the Follo Line Project. 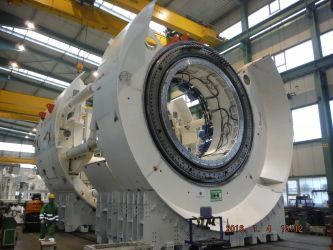 The first TBM should be ready from the factory in February, and later it will be transported to Norway and assembled again inside the tunnels. Two of the TBMs will drill north towards Oslo and two will drill south toward Ski, with a base at Åsland. The railway tunnels will eventually be 8.75 metres in diameter (excavation diameter is 9.96 metres), and about 18,5 km long.